Oh hello 2019, I didn’t see you there! 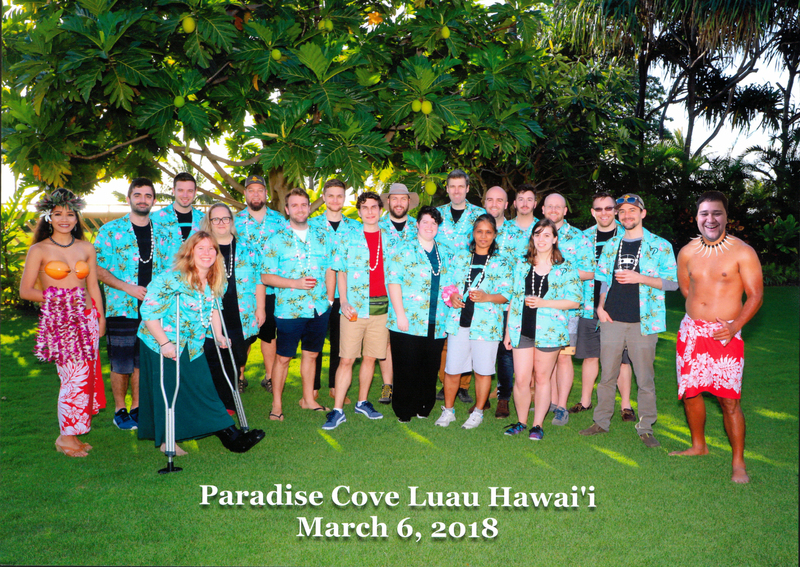 I was just thinking about our next meetup in Hawaii this May, and how it’s past time to (finally) publish our memories of Prosparadise from 2018. 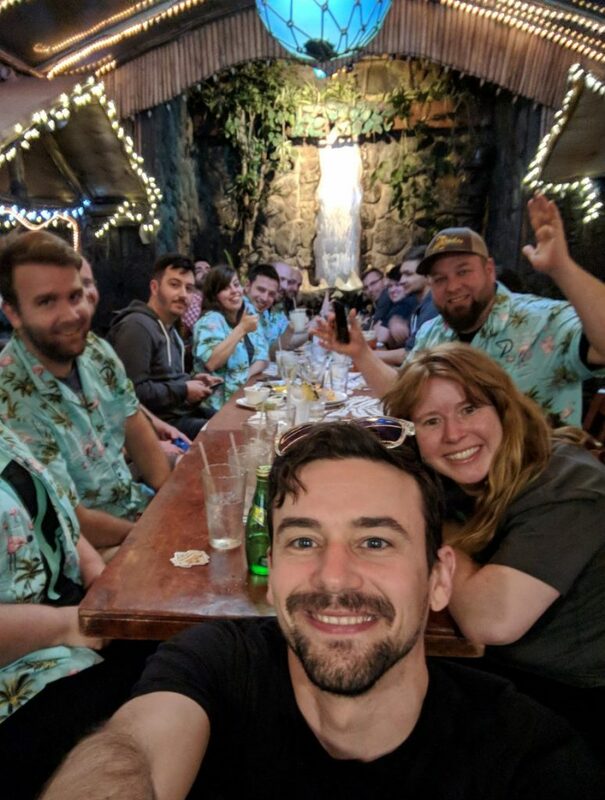 It’s hard to believe it’s already been so long since we had our meetup finale dinner at the La Mariana Tiki Bar. 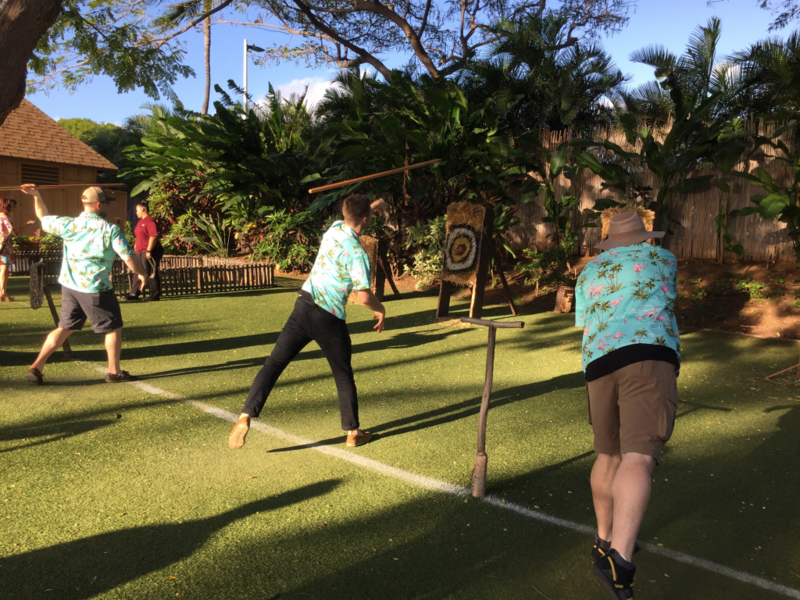 So much has happened since we were rocking our awesome Prosparadise shirts while drinking Mai Tais and Zombies! Time has seriously raced by. We’ve celebrated some major milestones – in the past months we’ve launched a new product, welcomed AutomateWoo to the family, marked six years of Subscriptions, celebrated four years of Prospress, and reached a score of Prospeeps! 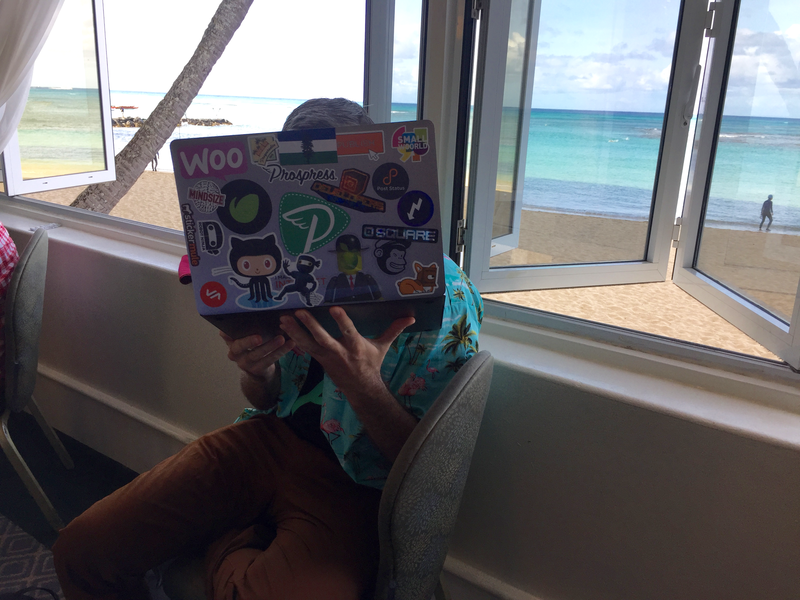 Ron Rennick also joined us as the first full time WooCommerce core contributor and we sent our teams out on their first separate meetups! It has been a busy time to say the least. 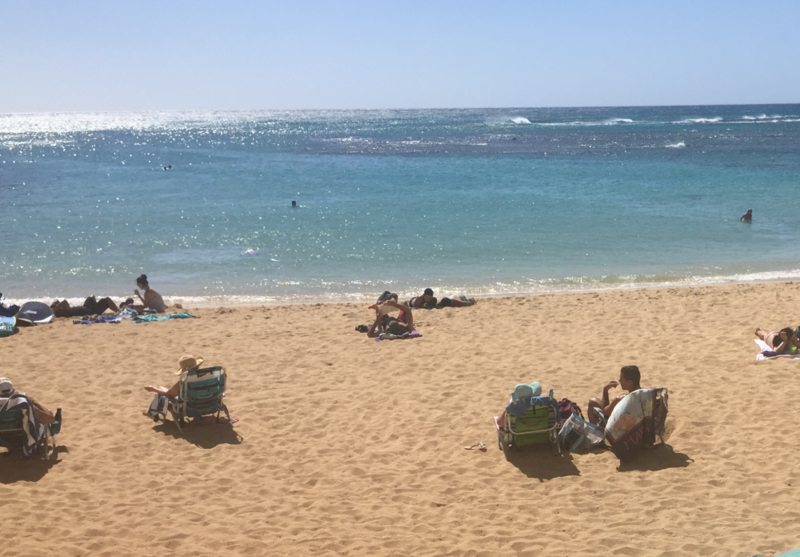 But while the Prosparadise tans may have totally faded, some of us are regularly reminded of Waikiki beach because that famous sand still lurks at the bottom of our purses. 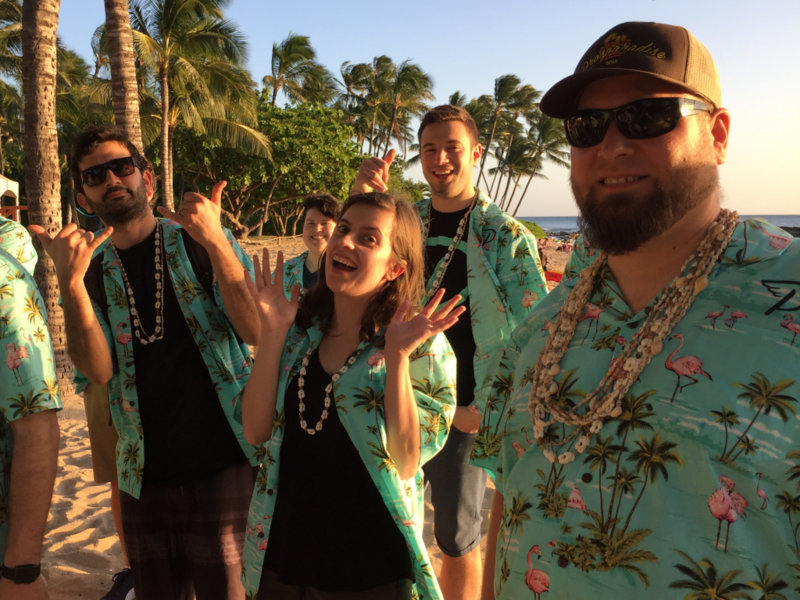 Given that it has been eight months since Prospress went to Hawaii, you might expect that the team is well and truly back to normal. That’s both true and not true: we have been back to “normal” life for a long time, but it’s actually a new normal, and it’s a better normal than the one we had before the meetup. Things will always be different, because we spent a week living together in a Prospress Paradise, which is exactly as good as it sounds. In Australia in 2016, we had six people on our meetup. Paris 2017 saw us nerd herding a group of eight. 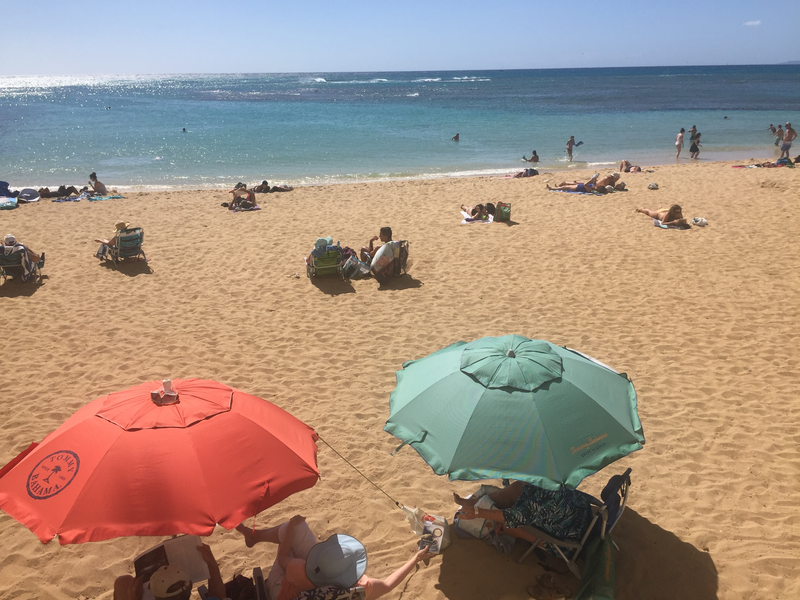 In Hawaii 2018 there were eighteen, between our sixteen Prospeeps and two Friends of Prospress™. That meant half of the Prospress team had never been to a meetup, and most of our group had never met in person. Some of our folks had only been with the company a few months (or in Zach’s case, a few weeks!). 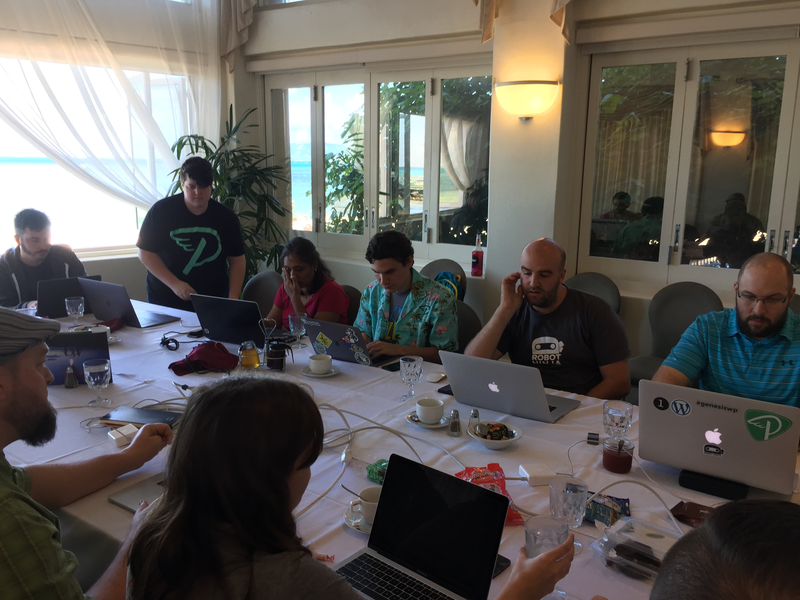 So Prosparadise was an exciting opportunity for everyone to get to know each other, but it also raised the stakes for the Peopleware team. As the company is growing quickly, one of our ongoing concerns is that some of our Prospeeps could become disconnected from the team. We don’t want to lose the feeling of closeness and our sense of working with friends. Since most of our team are introverts, the goal of accelerated team bonding could have been quite the challenge (to say the least). We knew everyone worked well together online, but we had no idea if we’d discover (ahem) “personality differences” once we were IRL. Happily, everyone turned out to be the same offline as they are online and there were no unpleasant surprises. To encourage team bonding without resorting to trust falls or blindfolded maze games, I scheduled the meetup sessions and activities around Tuckman’s theory on the stages of team development: forming, storming, norming, performing, and adjourning. Unfortunately, our most enthusiastic participant at Prosparis, Cesar, was not able to join us for Prosparadise due to visa issues. Fortunately, we were joined by Manos and Dan – who were two of our favourite Friends of Prospress™ (or should that be Prosfriends?). As the founder of SomewhereWarm, Manos has worked with us on several different software projects, including Subscribe All The Things. We met in Spain at WordCamp Europe 2015 and got on like a house on fire. Whenever Manos is around, the conversation always seems to go several layers deeper, to our everlasting delight. Something tells me it’s hard to go wrong when choosing a hotel in Hawaii, but we really struck gold. 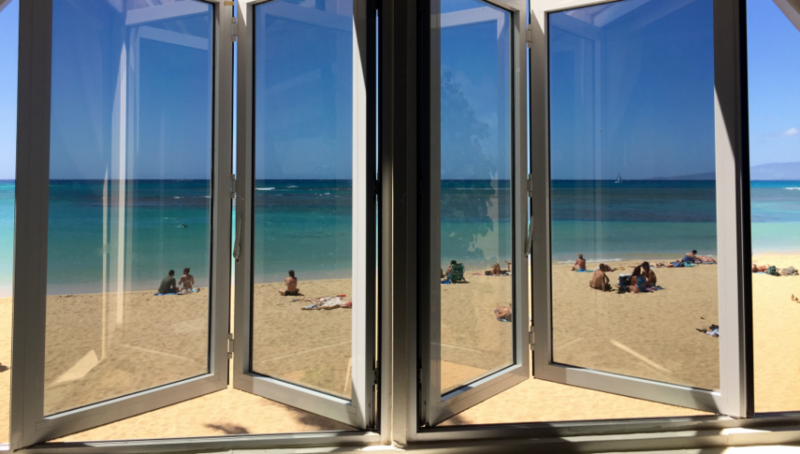 It’s on “the quiet end” of Waikiki, which was still only 10 minutes walk to downtown. The hotel itself was actually paradise, because it is on the beach, like literally (not just figuratively) ON the beach. Some of the younger and more (ahem) acrobatic team members jumped out the conference room window during lunchtime, landing directly on the sand. This was not really approved by the Department of Health and Safety, but 100% approved by the Department of Fun. While inside tapping on our keyboards and listening to presentations, we only had to look out the window to find paradise. Sunbathers, hula hoopers, weddings, and friendly seals all passed by just outside. I’m pretty sure a lunchtime picnic on the sand and a quick paddle in the water is the cure for anything. So this was our crew, and this was where we were. 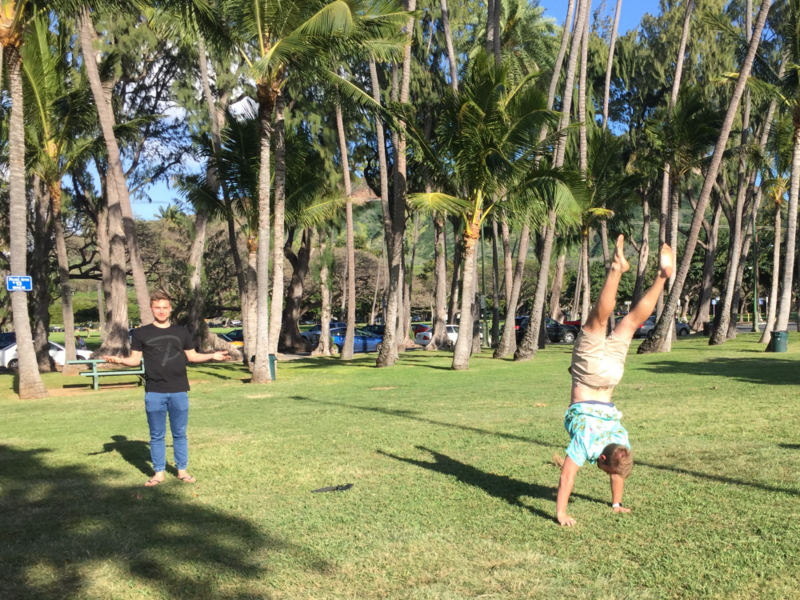 Now what did we actually do in Hawaii? 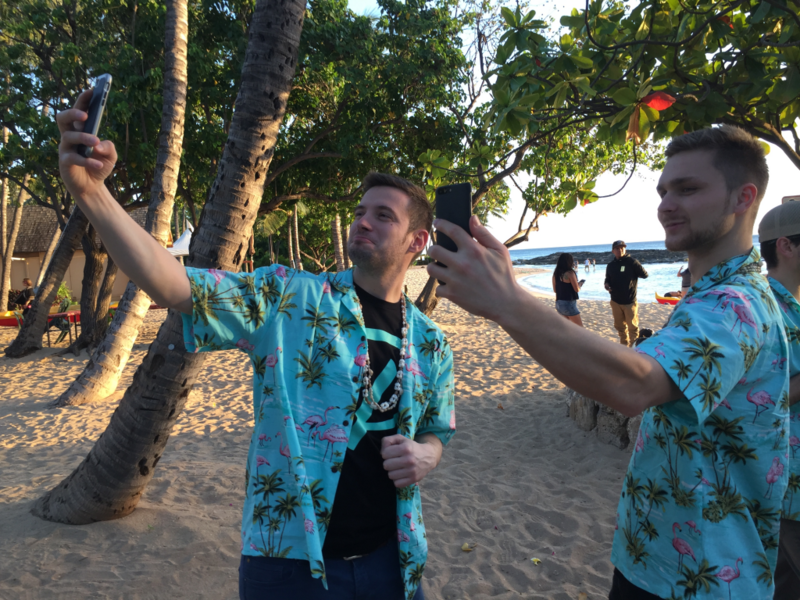 Here’s a day by day log of what it’s like to be gathered in a tropical paradise with a big group of new friends. Monday morning started out with a big team breakfast to fuel up for our first day. Once we were well fed and well situated in our conference room by the sea, Brent officially welcomed us all to Prosparadise. He gave us an overview of Prospress past, present, and future, while also setting the scene for what we wanted to achieve from the week. During the next session, Lauren introduced us to “What Subscriptions Sells”, a fascinating tour of some stores using our flagship product. Then we heard from Matt about “What Robot Ninja Tests”, with a brief overview of some sites using our automated checkout product. It’s always valuable for the team to connect with the customers we serve, and to be inspired by the entrepreneurs who use our products. 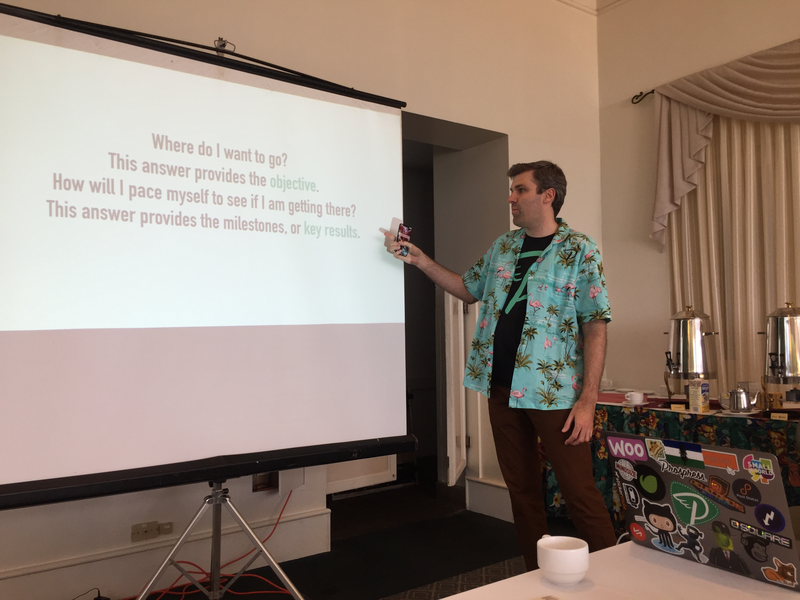 It’s something we try to do with the Small Woorld blog, and these in-person sessions were great examples of who we are helping to “prosper with WordPress”. The next session was the lightning talks, which were equal parts hilarious and interesting. Each person talked for between one and five minutes about “literally anything”, which meant we had presentations about favourite travel, pets, and hobbies. Nick gave us a highly entertaining talk about 10 things he learned in 10 years as a pilot, which I’d love to turn into a blog post in future! (watch this space). The last official activity of the day was a team favourite: round robin one-on-ones. The team hiked for two hours around Diamond Head while asking each other some deep and meaningful questions (and a few fun ones). It was perhaps a little too much exertion for jet-lagged Prospeeps on their first day in the Hawaiian heat. Maybe support never sleeps, but James does when he faints during dinner. Yes, that happened, and yes, he was fine. But we are definitely reviewing how many of our team are certified first aiders for our future meetups #lessonlearned. The first presentation of the day was a video call with Cesar, with his face projected much larger than life on the screen in the conference room. He said he felt like he was in an episode of Black Mirror, but (to the best of our knowledge) nobody sequenced his digital DNA and sold it on the dark web! Cesar explained the project he has been working on, which is a new tool to help us in support. It would have been better if he was with us in person, but it was still fascinating to hear about this new project. Lightning showcases made up the schedule for the rest of the day. Each of us had five minutes to stand up and say what we are working on, what it looks like now, and where it’s going in the future. Dan and Manos also talked about their projects. Dan gave us an introduction to AutomateWoo, which we could have listened to all day, there’s so much happening. Then Manos opened up a semi-philosophical discussion about the “subscriptions way of life”, in addition to his talk on SATT, which was in equal parts inspirational and thought provoking. 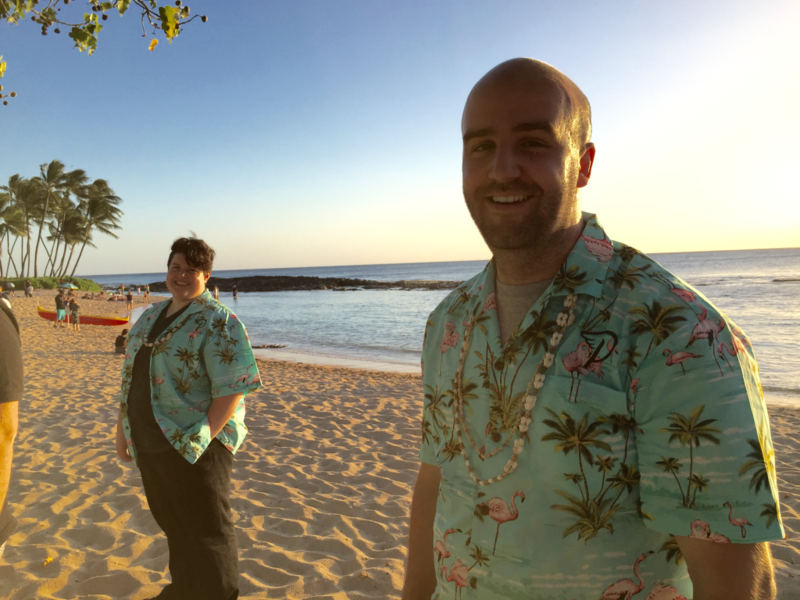 On Tuesday night we had quite the cultural experience, with a luau at Paradise Cove. We tested our spear-throwing skills, earning shell necklaces for our efforts. 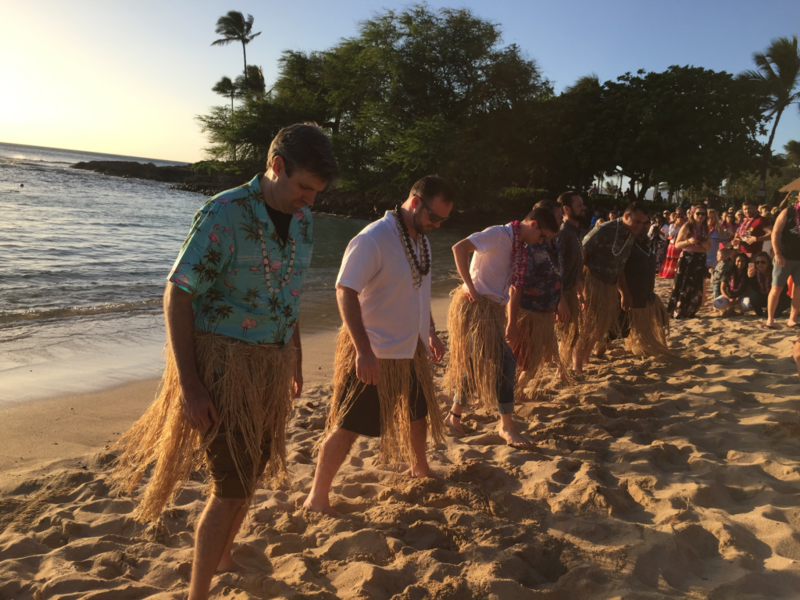 Brent donned a grass skirt and helped to pull up the fishing net and do the hula. As the sun began to set, an amazing golden hour gave us the perfect ambient light for some really mad selfie action. Gotta do it for the ‘gram! After hours of performances from singers and dancers from around Polynesia, Jeremy couldn’t wait any longer and jumped on stage to show the crowd his moves! In an alternate version of the simulation, he now lives in Hawaii and is a professional hula dancer. Wednesday began with a routine we were finding very easy to love – the whole team breakfasting and then coworking in the conference room. With the amazing view around us, we again worked to clear that support queue. After the support session, we tested something relatively new for our meetups – we tried to run a hackathon. 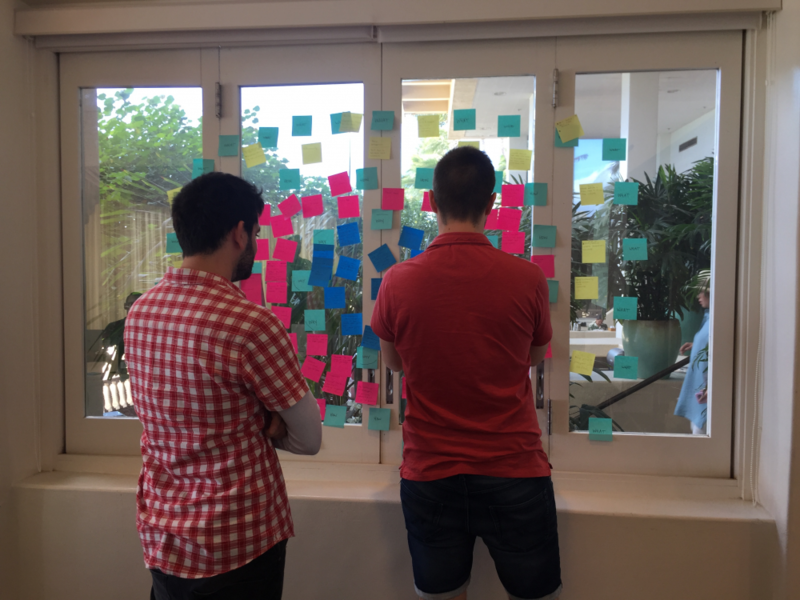 In Australia at Meetabout we attempted a hackathon to brainstorm a new product idea, but this time we had something specific in mind: a new structure for the Prospress website. We didn’t quite get our plan finished but it was worthwhile to have simultaneous brain cycles on it. After our hackathon I kicked off a round table discussion about the five Ws of hiring, which are: who do we want, what do we want them to do, when do we need them, where will they work, and why we hire people. Rounding out the day, Jeremy’s presentation on why we should be using XDebug and IDE in development had everyone talking during the support session in the afternoon. Dinner was at Sansei Sushi, where we ordered enough food for most of Honolulu, and somehow managed to eat it all. On Thursday we worked on articulating Prospress’ values, starting off with a short video from Simon Sinek’s talk Start With Why (one of my favourites). Then I did my best to lead an activity about our core purpose and core values, which was a redux of the activity we did at Prosparis. I’d like to make a tradition of repeating this at future meetups, to see how or if the answers evolve as we add new people to the team. It was really interesting seeing how people’s values were expressed as group values, and how they inform each individual’s purpose for working with Prospress. In a nutshell, I think it’s safe to say we have a group of idealists whose purpose is to create software so entrepreneurs can live their purpose. We want to make the world a little better while living our own best lives. Sounds ideal, right? Next, Brent led a session on what makes an 11 star experience. He introduced some corporate-style acronyms, possibly for the first time ever at a Prospress meetup. We learned all about OKRs – what they are, why we’d want them – and we then set OKRs for our teams and for ourselves. After all that goal setting action, most of the group went for a hike to Manoa Falls before the Prosparadise all-time good-time beach party. 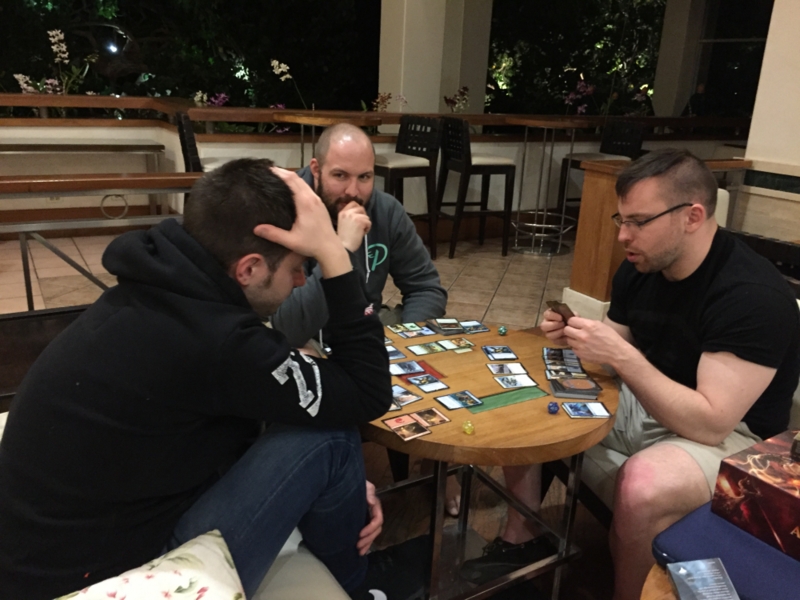 The after-after party ended up with half the team in a Magic the Gathering game in Brent’s hotel room, with smaller groups in deep philosophical discussions in the corner. Early Friday morning most of the team headed out on a catamaran to swim with turtles, cruising in the aqua waters of Honolulu Bay. A couple of us stayed ashore, including Carolyn, who had recently broken her ankle and was pretty much wheeled straight from her bed onto the plane. 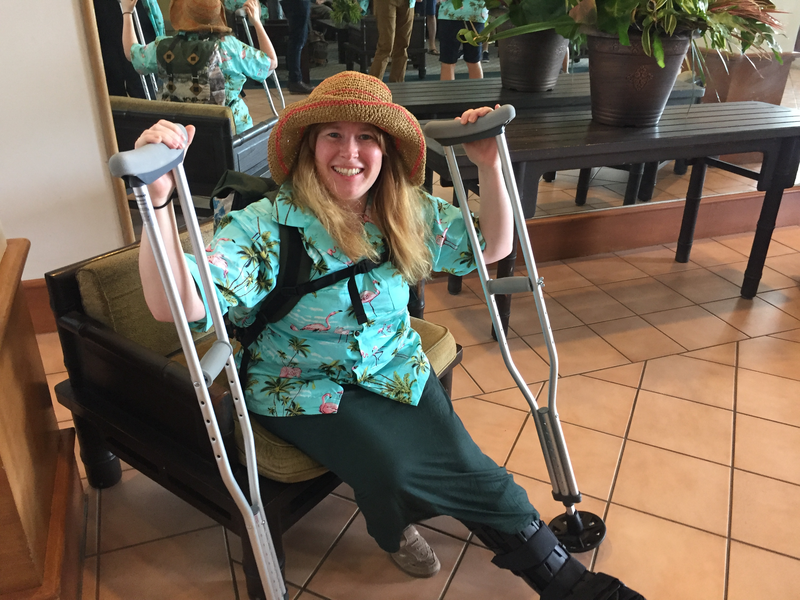 She spent the entire week gamely crutching around Honolulu. Her Stoicism and stiff upper lip would have made Churchill proud, because she didn’t complain once about the inconvenience or the pain. Our final task for the day was to bring our time at Prosparadise to a close. Wrapping up the meetup was difficult because there were so many good moments during the week! 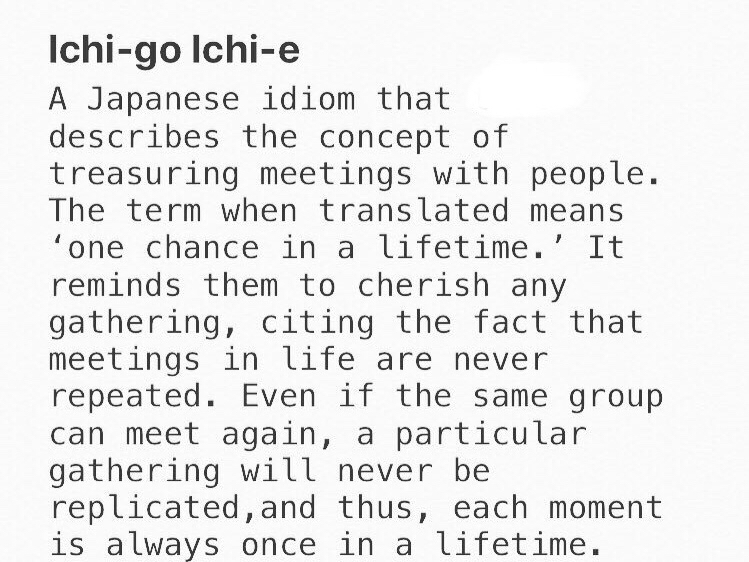 It was surprising how quickly we went from a group of people who didn’t really know each other that well, to being a team of people who just really wanted to spend every minute together. For a bunch of introverts, we didn’t spend much time alone. We suffered from some pretty serious FOMO! 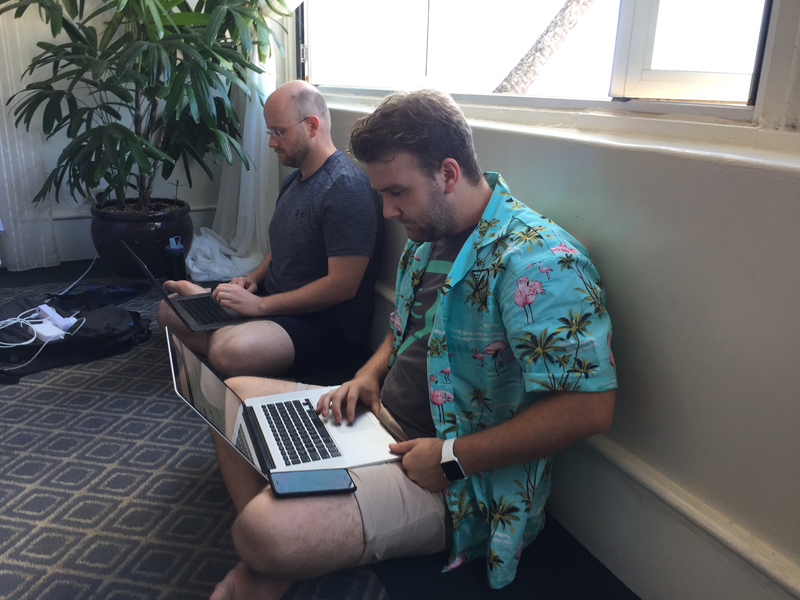 On this Friday afternoon, we sat around the conference for the last time during Prosparadise as the glorious Waikiki sun beamed in, illuminating a group of happy and tired faces. One by one, we each offered a couple of words to describe what the week had meant for us, and we heard expressions such as “deep”, “rich”, “amazing”, “complete”. 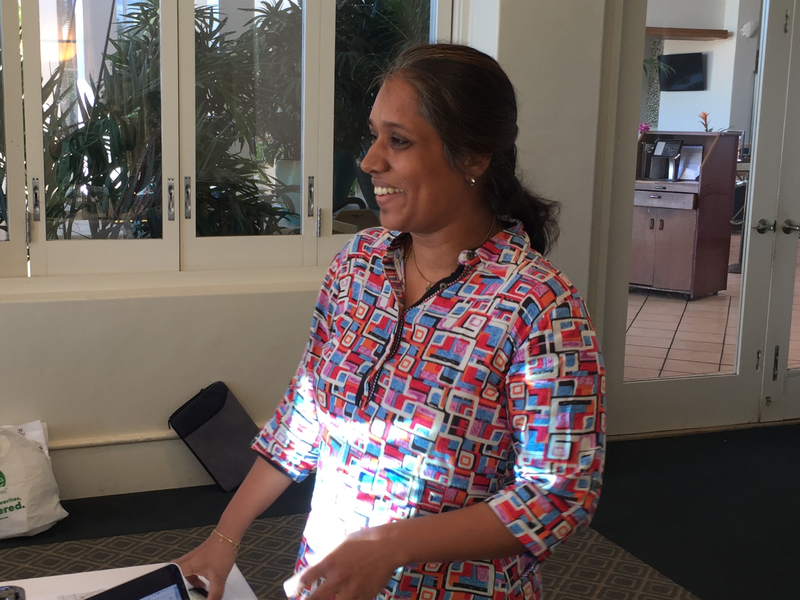 And then we heard from Menaka, who read the translation of a Japanese idiom. In retrospect, we might try to blame it on the exhaustion, but half the group were decidedly misty-eyed, while the other half stoically held a stiff upper lip and tried not to look directly at anyone. As the sun set on our last day, we all had the bittersweet feeling that we really didn’t want the week to end. 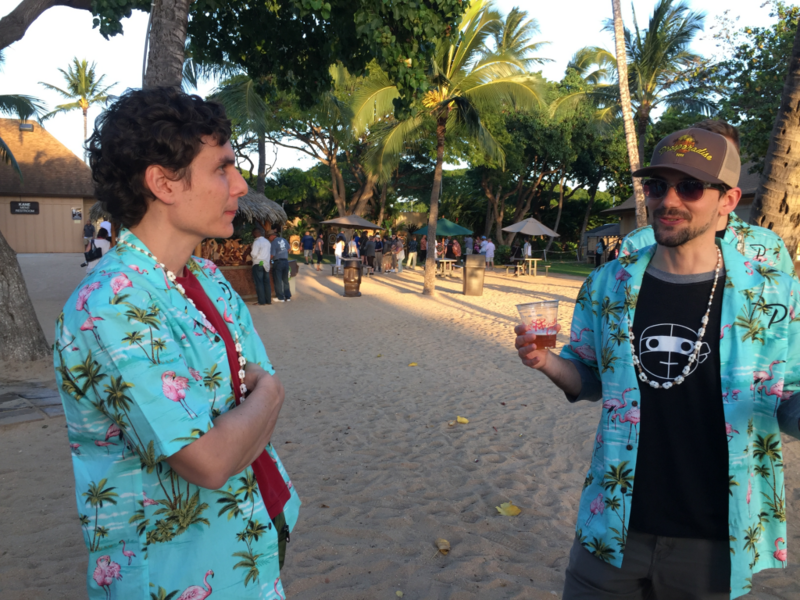 So we dressed up in our fancy Prosparadise shirts, and went to the most amazing tiki bar in Honolulu. The La Mariana Sailing Club is everything you’d want a tiki bar to be, and even includes an indoor waterfall. Our drinks order featured quite a few fun names like Lava Flow, Zombie, and of course, Mai Tai. We toasted to a successful Prosparadise and started the process of saying our goodbyes with the early departures of Brent and Jorge, who had to return to kids and kitties respectively. On Saturday our breakfast crew was a little smaller, and then our lunch crew was smaller still, as Prospeeps were farewelled. Even in our “free” time, we still very much wanted to spend time together. Whoever was around still went hiking and lunching together, squeezing the last out of Prosparadise. Anyone who knows Prospress knows how we love puns and portmanteau words, so Prosparadise was the perfect name (thanks Lauren!) for our sixth company meetup. Over the course of the week we saw the evolution of our group: forming, storming, norming, performing, and adjourning (although as far as I know, we mostly skipped the storming). We went from feeling slightly nervous about meeting each other to feeling that we didn’t want to say goodbye, within the space of a few days. Our newbies went home at the end of the week with the sense that they’d just made 17 awesome new friends. We learned a lot about each other, and about the company. 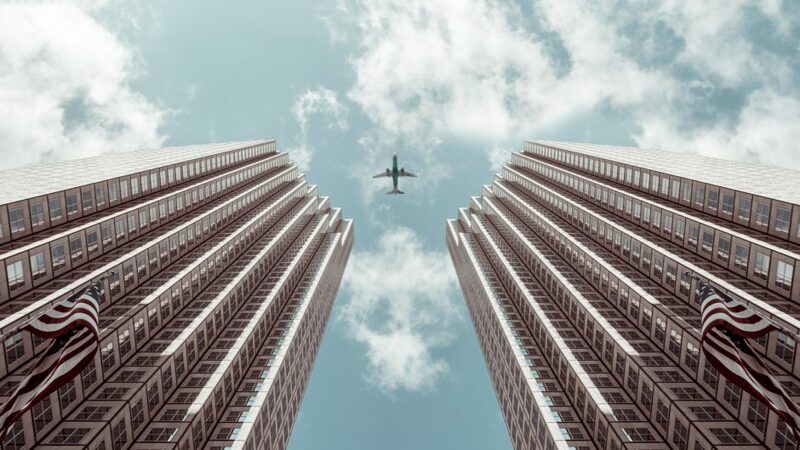 Seeing all the different projects and products happening across Prospress refreshed our perspective and inspired us for what’s to come in the future. And now when we read messages on Slack, we can put a face, voice, accent, tone, and body language to the text communication. We might be a distributed company, with most of our interactions mediated by technology, but we are still a team of humans, and we’ll always be mindful of our shared humanity. It’s such an incredible privilege to meet with our fellow Prosfolks in person and we can’t wait for the next time we get to hang out IRL in May 2019 for Prosparadise 2.0!